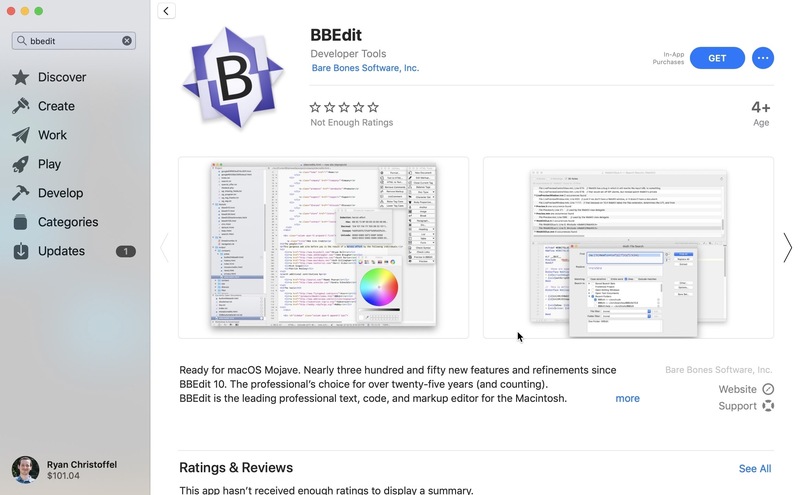 For those who wish to get BBEdit from the Mac App Store, the app is a free download, and you can use it in full up to 30 days at no cost, after which a subscription will be required to unlock its web authoring tools and a variety of other pro features; basic editing functionality will continue to work without a subscription, however. Subscriptions are available at $3.99/month or $39.99/year. One advantage of the subscription option is that it will always provide access to the latest version of the app, whereas purchasing the app directly from Bare Bones will earn you the current version of the app only – if you want major new versions as they're released, you'll need to purchase upgrade licenses. When Apple unveiled the new Mac App Store last year, it promised that not only would the app itself be modernized, but the store would be ripe with major app additions as well. Following Microsoft Office and Panic's Transmit, BBEdit's arrival today helps make good on that promise. This time last year some of the Mac's best, most popular software wasn't available in the Mac App Store; it's good to see that begin to change.